A vinyl privacy fence has many uses, from keeping your kids and pets safe to enclosing your pool, a privacy fence does just that, creates privacy. 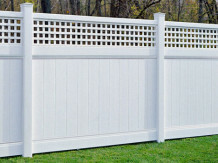 Some people choose the basic, standard fence – no texture, no top accent – while others prefer the more colorful, textured models, both are quite beautiful in almost any landscape. 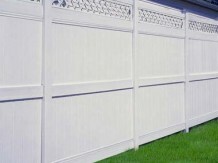 A vinyl privacy fence is strong and durable and requires very little maintenance. Over 16 different colors with realistic looking wood-grain and stucco textures as well, all that can be kept clean and pristine with the occasional pressure wash. Available Heights 4′, 5′, & 6′ tall. The boards are 7/8″x 7″ and there are 13 per section. 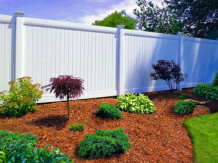 The style has THE MOST COLOR SELECTIONS AVAIL out of any other fence style. Colors include both smooth textures as well as the stained wood-grain textures. Available colors are: White, Almond, Natural Clay, Arbor Blend, Arctic Blend, Brazilian Blend, Frontier Blend, Honey Blend, Sierra Blend, Weathered Blend, Timber Blend, and Canyon Blend. 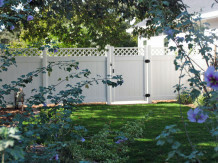 Bufftech Westminster is version of the Chesterfield privacy fence from CertainTeed with a square lattice topper. Bufftech Huntington is the only style in the privacy collection that offers a concave picket accent at top. It is actually the only privacy style that has pickets that stick above the top rail. It is only available in an overall height of 6ft. tall (4ft. 8in solid with 1ft. 4in top accent). It is available in White and Tan. 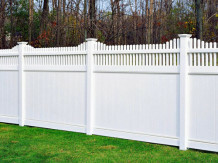 Galveston is the only fence style that is available in heights above 6ft tall. It comes 7ft or 8ft. tall. It is used for people who are trying to close off nearly everything that surrounds them, or where the need is for a taller fence, i.e. commercial applications. Because it is such a tall fence, it has steel reinforcement in the top, bottom, and midrails. The steel insures strength and durability of the section. It is also available with a diamond lattice top-accent and comes in smooth and wood-grain colors/textures. Available colors are: White, Almond, Natural Clay, Weathered Blend, Frontier Blend, Arbor Blend, Arctic Blend, Brazilian Blend, Sierra Blend, Honey Blend. A more economical version of the Chesterfield! Available in heights 4′, 5′, & 6′ tall. The boards are 5/8″ x 11 3/8″. Comes in White and Almond.